"knock down" state and is properly packaged in customized cardboard boxes for a guaranteed safe arrival. The furniture requires minor assembly and the hex key required is provided. Flat fee of $50Local delivery in greater Victoria area. All locally delivered patio furniture comes fully assembled and is courteously delivered directly to your patio usually within 3 days. The fee for this service is $50. Shipping within British Columbia usually takes 3 to 5 days. There is a flat fee of $50 on all orders under $500 and a flat fee of $100 on any order $500 or more. For smaller communities not serviced with regular courier service, a surcharge may apply. Orders under $500 a flat fee of $100. Orders over $500 a flat fee of $200.Shipping to rest of Canada. Shipping outside of British Columbia to the rest of Canada usually takes 5 to 10 days. There is a flat fee of $100 on all orders under $500 and a flat fee of $200 on any order of $500 or more. For smaller communities not serviced with regular courier service, a surcharge may apply. No PST is charged for orders shipped outside of British Columbia. Shipping to the Continental US. Shipping to the continental US usually takes 5 to 10 days and in most cases is by FedEx. Shipping rates vary based on the destination. You can either phone us for a quote or simply fill out your address information with your "wish" order in the shopping cart. The shipping price will appear in the total before the final placement of the order. Smaller communities not serviced with regular courier service, a surcharge may apply. You will be notified by phone if this is the case before we process the order. No Canadian taxes will be charged, however local taxes may apply and may be charged upon arrival of the shipment. These fees are the responsibility of the receiver. Shipping outside of North America. 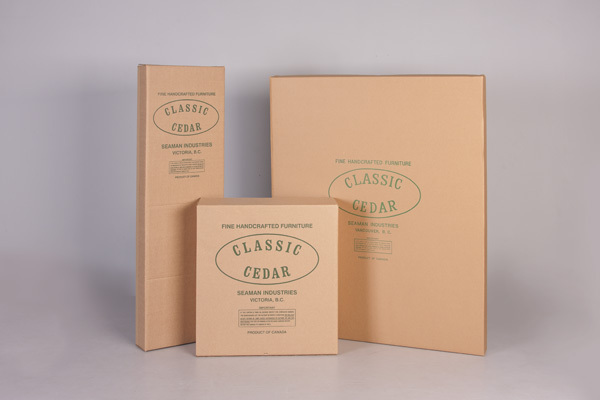 We have shipped both large and small quantities of Classic Cedar furniture around the world. Immediately upon delivery, inspect the packaging for punctures, and other damage that may have resulted from rough handling. If packaging appears damaged bring it to the couriers' attention and take some photos before opening the parcels. If your furniture arrives damaged, please take pictures of it and email them to us. We will take care of you by sending you a replacement part free of charge. You receive prior written permission from us. It is returned in good order and carefully repackaged the way you received it in its original packaging. Please note that all shipping charges, duties, and handling fees are non refundable. We are so confident in our quality of craftsmanship and design that we can offer this unprecedented guarantee! No other cedar patio furniture company that we know of offers a 10 year guarantee. Classic Cedar patio furniture and Gazebos are designed for comfort and built to last. 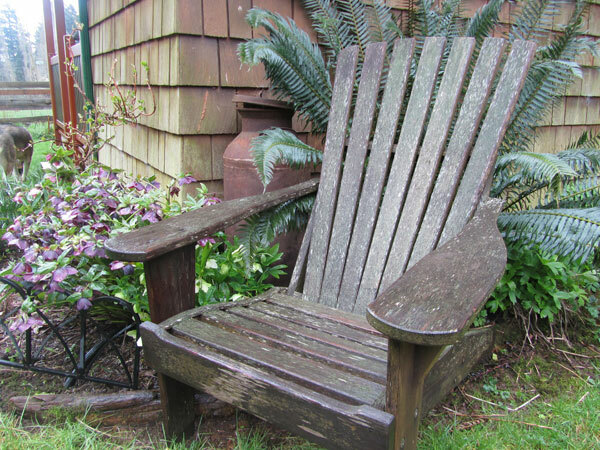 We have examples in our outdoor showroom of our chairs that we built over 20 years ago . We left them unstained in the rain, sun, sleet and snow for over 20 years and they still have enough structural integrity to be used today! Keep the bolts on your furniture snug. This will prevent unnecessary wobble and wear. Let us apply a 3 coat finish of "Sikkens" Cetol 1 Natural stain to your patio furniture and you maintain the finish by applying a maintenance coat every 2 to 3 years. If these two steps are followed, we guarantee that your patio furniture will retain its structural integrity under normal use for a minimum of 10 years! 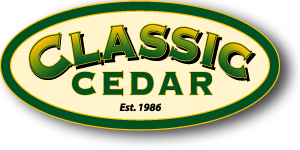 Should your Classic Cedar patio furniture or gazebo show structural damage caused by normal use within 10 years of purchase and you have followed the two steps above, Classic Cedar will fix or replace any failed component at no charge! Please note: Longitudinal hairline cracks may appear over time and are a natural characteristic of wooden outdoor furniture. These hairline cracks are non structural and will not affect the safe use of your furniture. Non structural hairline cracks are not covered under the guarantee. To make a claim, provide a written description and photos of the broken part and email it to info@classiccedar.com. We may ask you to send back the broken component for repair or we may send you a new component. Do not ship any parts back without written permission from Classic Cedar.